In this series of blog posts, we tell you methods to perform social media audit for free. In this second part one, we discuss self-audit—audits of one’s own social media channels. 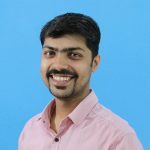 I have run a digital marketing agency for over four years now. Whenever I pitched for a social media service or received an inbound call, I was asked for an overview. Identify the gaps. See what’s missing. Find the small wins in their past efforts. I would keep asking this question to myself: How can I add more value to their social channels? Almost all of the time, I relied on social media audits. I would bring all metrics of their social performance in a single sheet, turn them into info, and provide insights. There’s more than one way to do so. 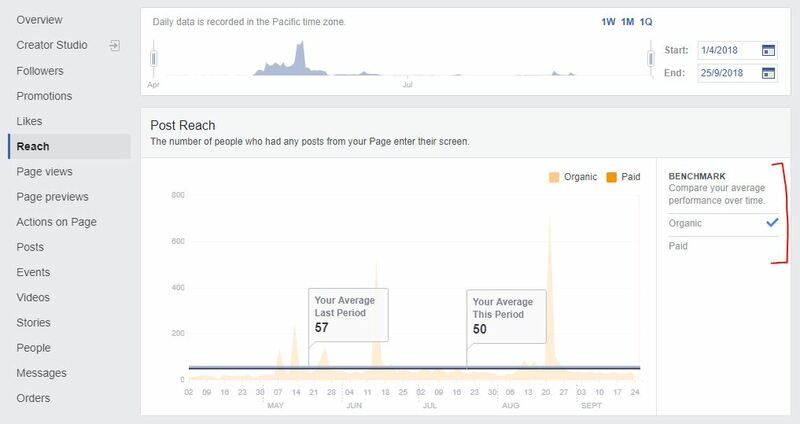 Sometimes you can do it using in-built tools like Facebook analytics and Twitter analytics. Sometimes, to capture data of a long-time and analyse it, you need social media analytics tools. On your Facebook page, go to the ‘Insights’ tab in the top menu. This will give you access to all data of your Facebook business page. You will be taken to the ‘Overview’ section which gives you a top-level view of your social media performance—actions on page, page views, previews, likes, reach, post engagements, etc. 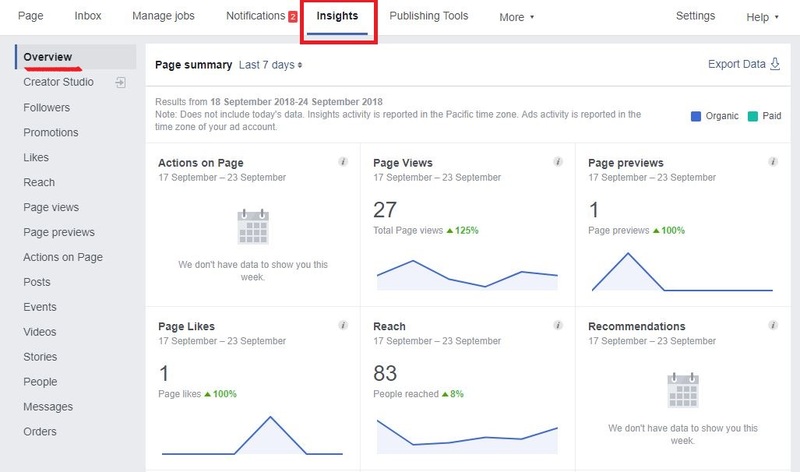 On the left side of Facebook Insights dashboard, you will see column for each metric–followers, promotions, likes, reach, page views, page previews, actions on page, posts, events, videos, stories, people, messages, and even order. For instance, you will find metrics that impacts your reach in ‘Reach’ section—timelines of total reach, timeline of reactions, comments, and shares which help you reach more people. Facebook also allows you to stretch or shrink the timeline by choosing the Start and the End date from the top-right corner. However, in some sections of Facebook insights, you can’t get data for more than 28 days. But you can export your data from ‘Overview’ tab by clicking on ‘Export Data’ in the top right corner of the section. Facebook also allows you to create benchmarks by calculating averages over a period of time. You can do so by clicking the Organic or Paid on the right of each graph. Posts performance: You can check that by going in the Posts section. 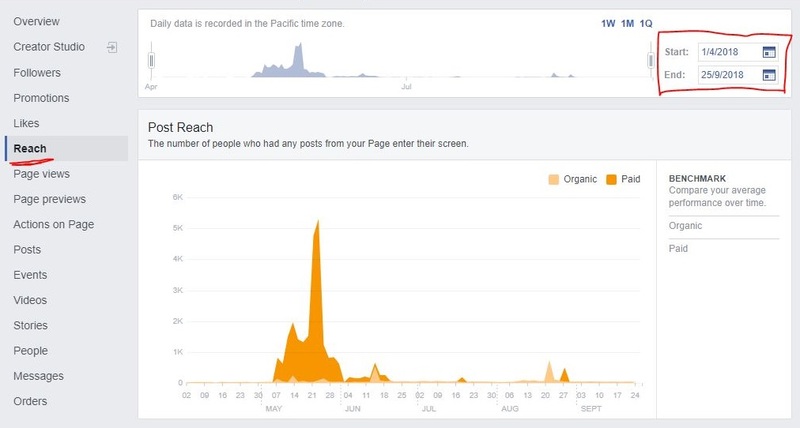 You can also see the breakdown of engagement, organic vs paid reach, and engagement rate for all your posts. It also has a section where you can check top posts from your competitors. Actions on page: This section tells you how many people who visited your page took some action. Those actions are categorized into: Get Direction Clicks, Website Clicks, Phone number clicks, and Action button clicks. You can also see the demographics of the people who took these actions. 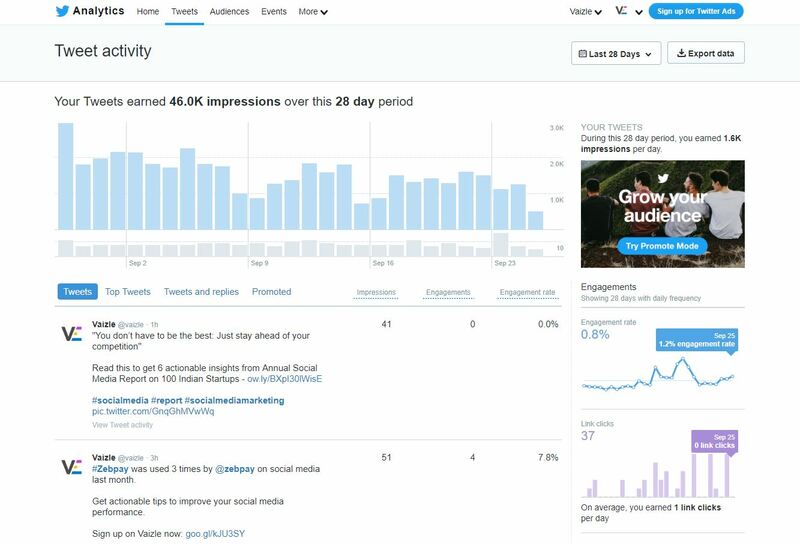 Since there is no distinction of business vs personal profile on Twitter, Twitter analytics doesn’t come from the first day in your profile. 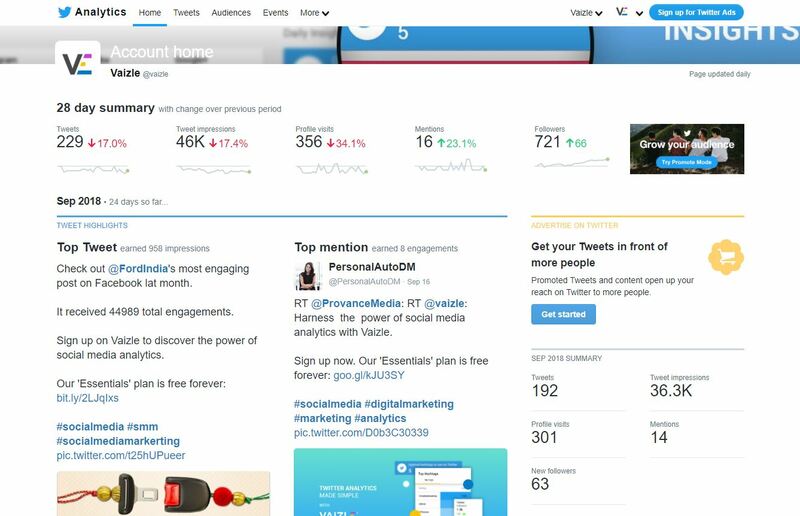 You need to go to analytics.twitter.com to start accessing the Twitter Analytics dashboard. From then on, you can access it by clicking the drop-down at the top-right corner of your screen and clicking Analytics. You can also see top tweet, top media tweet, and the top followers of the month. Then as you scroll down, you can check this performance for each month. In the ‘Tweets’ section, you can also check the performance individually of each and every tweet, top tweets, replies, and promoted posts. You can export this data and show to your client or lead in an Excel sheet. With Twitter analytics, you can also tell your lead about the type of people following them. This will in-turn help to tell your prospect whether right people are following them on Twitter or not. In this section, you can see the growth of your followers over a period of time. This section will also give you gender specific data for your followers. Then there are other sections where you can see major events around the world. It’s under the Events tab. It shows all the major events happening across the world. It has dedicated section for movies and sports. Recurring trends show you hashtags which periodically becomes popular on Twitter. You can use all these section to create more targeted campaigns. LinkedIn had come a long way in terms of providing analytics for LinkedIn company pages. You can find analytics for your LinkedIn page by clicking on the third option in your top menu bar. In the visitors’ section, you will find the total number of page views and unique visitors over time. Here data is measured across desktop and mobile for logged in LinkedIn members. You can see how visitors from desktop and mobile platform grew over a selected period of time. LinkedIn provides visitors’ demographics, you can see data for job functions, location, seniority, industry and company size. LinkedIn updates analytics is designed to help you understand the engagement metrics for your page. You can see Impressions, total likes, comments and shares on your page. Here, LinkedIn also helps you segregate the organic and sponsored engagement for your page. You can also check engagement on individual posts. LinkedIn followers’ analytics will help you understand your follower growth, total followers and organic vs sponsored follower gain. 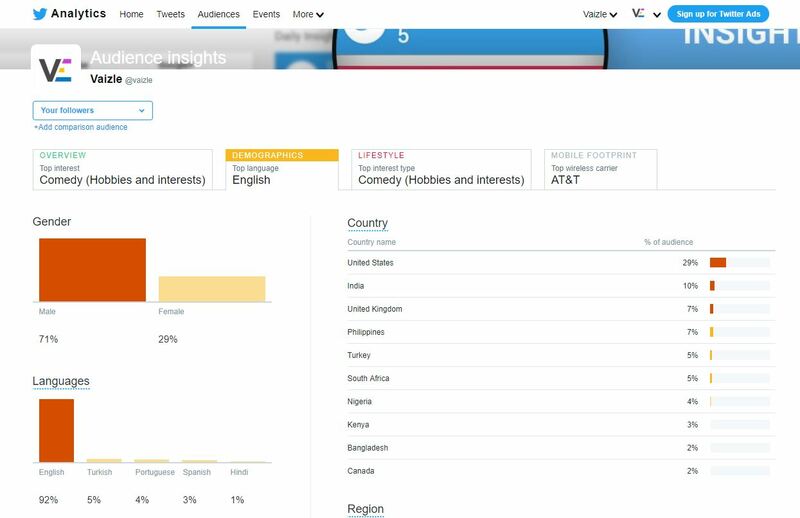 You can also see demographics analysis for your followers. You can sort this data for job functions, location, seniority, industry and company size. You can also compare your followers with other companies. It takes a lot of time and effort to create a video content. So, it’s of highest priority that we should measure the results of our video content. To check your YouTube channel analytics, you have to click on profile icon and then go to creator studio. Once you are in the creator studio, you can find analytics on your right side of the screen. In here total watch time, views and subscribers are listed for last 28 days. For in-depth analysis, click on ‘view all’ and you will go to the analytics overview. In overview, you can see timeline graphs for total watch time, average watch time, views, likes, comments, shares, dislikes, and subscribers. You can also see a list of top 10 videos for your channel. You can sort these top 10 videos by watch time, views, likes, and comments. In the bottom of the overview page, you can find insights about top geographies, gender, traffic sources, and playback locations. Once you are done with collecting and downloading data from different platforms, combine this data in a single report. For more clarity, I would recommend you to perform cross-channel (sum relevant parameters from different social media platforms) analysis. Now you are ready to pitch for social media services and convert a perspective lead into a valuable client. Or measure performance of your own social media channels. And yes, you can read the first part in this series of blog post. Please let me know in the comments what are the challenges you faced in performing this audit. I will try to address those challenges in my next blog post. Enjoy this article? Share it please.